My recent trip to Paris with Karigee came together for the sole purpose of seeing Sweeney Todd at the Chatelet du Paris. If you know me at all, you know I LOVE this Stephen Sondheim musical. I purchased our tickets many months ago, afraid that I had the date wrong or the section wrong or the show wrong, and I remained afraid until I actually had tickets in hand and could smell the sweet scent of their ink at 20 minutes to curtain time. My anticipation and excitement was already boiling over when we entered the theatre. We were surprised and thrilled to discover that our row D seats were on the center first row! I peered into the orchestra pit and immediately realized the thrill of what it would sound like at the mere site of the huge orchestra. To hear this score with a 28 piece orchestra playing Jonathan Tunics original orchestration would be a dream realized. The cast was mostly unknown to me. I did know Rod Gilfrey who was to be Sweeney from various opera, but he shared the role with Franco Pompani. Our Sweeney for the evening was Franco, which wasn't in the least bit disappointing when we heard the beauty and power of his baritone. He was handsome but menacing and brooding. He acted the role fine too. The rest of the cast - Joanna - Rebecca Bottone; Anthony Hope - Nicholas Garrett; Judge Turpin - Jonathan Best; Beadle Bamford - John Graham-Hall; Beggarwoman - Rebecca de Pont Davies; Pirelli - David Curry; Toby - Pascal Charbonneau - was magnificent as well. It was clear that this production was cast vocally rather than actorly and combined with the orchestra and the theatre, it could not have been more perfect. Particularly wonderful was Pascal Charbonneau as Toby, who was easy on the eyes but especially so on the ears. His "Nothing's Going to Harm You" coupled with Caroline O'Connor's portrayal was simply heartbreaking. I also loved the Beggarwoman played by Mezzosprano Rebecca de Pont Davies - she had a very rich, deep mezzo and brought even more sadness to the role (and hello, she sang Klytemnestra (opposite Susan Bullock) in Elektra at Opera North!). This production was by Lee Blakeley, who directed last season's A Little Night Music at Chatelet (which Kari saw in February 2010). Music direction was by David Charles Abell. Appropriate costumes were by Tanya McCallin and choreography by Lorena Randi. Mrs. Lovett fashioned sort of mess of red hair, but nothing specifically distinct. The set was hidden by a curtain that was a replica of a 19th century map of London. After intermission, the drawing of the Thames on the map was solid red. The production was in English with French super titles, on a screen above the stage and on the sides. I found myself glancing at them occasionally and it seemed like sometimes it was a literal translation but more of a description of what was happening, particularly when it came to Mrs. Lovett's lines and lyrics. The set was huge and very industrial-looking and employed the back of the stage wall and even the wings. There were always chorus members on stage. When the killing began, there was a stream of blood pouring into a gutter right on stage. It was also a very bloody production - I feel sure that if the orchestra pit had not been in front of us, we would have surely been drenched a time or two. This was also the largest production I've seen thus far, and while each were sublime in their own right; this was the most thrilling to my visual and auditory senses. It was like being completely enveloped in the rousing music and I felt very alive even while swooning from excitement. The curtain call was like being at a final performance of a Broadway show or even at the opera - it went on endlessly. My arms and hands were worn out from all of the applauding. The audience was very, very enthusiastic and never wanted to let them go. Even the orchestra members stepped to the front of the pit to turn and watch the actors. The curtain closed on them at least four times and each time opened to an even louder roar. Finally, the French began the rhythmic clapping - it is beyond exciting - and I thought they might have to do an encore or something to appease the raucous and demanding audience (and me!). 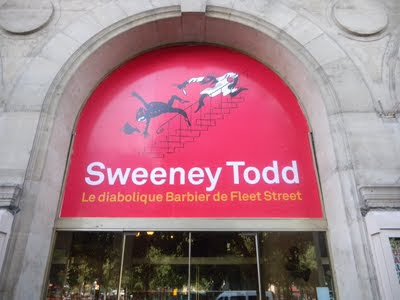 I remarked to Kari as we were leaving, even though I've seen Sweeney Todd a total of 25 times live now, not including the times I've watched the Angela Lansbury/George Hearn, the Patti LuPone/George Hearn and the Johnny Depp/Helena Bonham Carter films, it always surprises and thrills. It's a good thing I was not living in Paris or I'd be there every performance. Lucky you to be able to leap across to Paris! Thanks for posting the clips of the show.